This trend to audio learning is one of the reasons my team and I built MarketingPodcasts.com – the only search engine for marketing podcasts. It’s also why we produce multiple podcasts of our own, including Social Pros; Content Pros; Jay Today; and the forthcoming Business of Story podcast. We’re taking the audio up another notch and today I’m delighted to announce the debut of the Convince & Convert Podcast. Each week we’ll take the best and most impactful 3 or 4 blog posts among the 10 we publish here, and will produce them as podcast episodes for digital marketers that find it easier and more convenient to listen rather than read. For blog posts written by me, I’ll do the audio reads including a few recent gems like “It’s Time to Own Your Social Media Community” and “Can You Build a Content Marketing Super Brand?” so you’ll literally have my voice ringing in your ears from time-to-time. For blog posts written by our amazing cast of guest contributors, we have recruited professional voice talent to do the podcast recordings, so the podcast will be crystal clear for you. 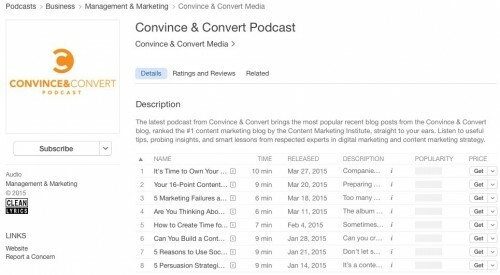 The Convince & Convert podcast is available now in iTunes, Stitcher, and Soundcloud. I would love it if you subscribed to the show. When we publish new blog posts that we turn into podcast episodes, we’ll embed that audio here, so you’ll be able to use a handy player (see above) and listen that way if you prefer. Thanks as always for your support of everything we do at Convince & Convert Media. I want your feedback on this new podcast! Please leave a review on iTunes, or a comment on Facebook.